Hey guys! 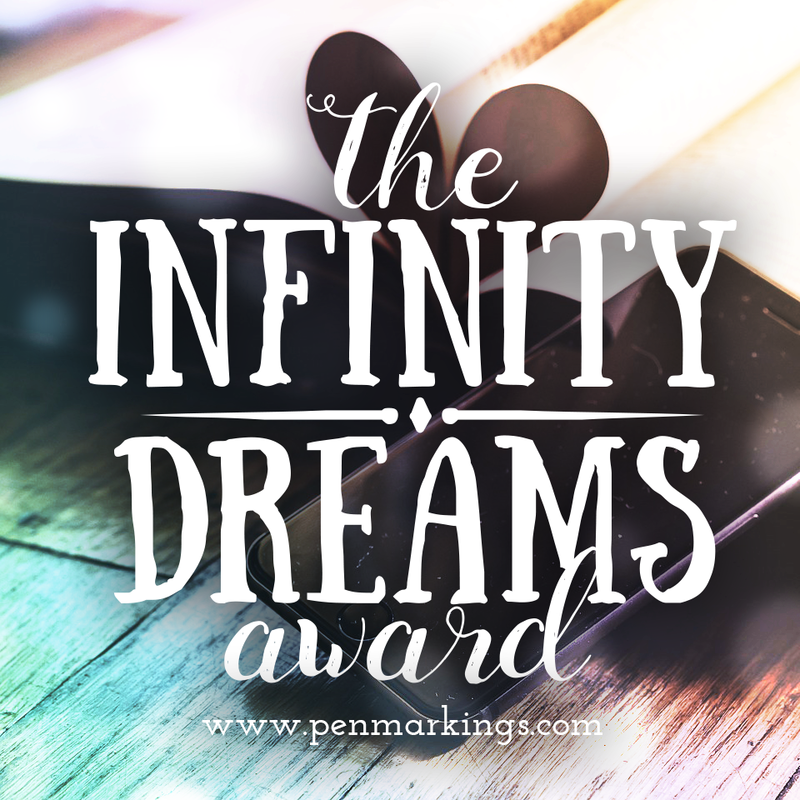 The lovely Mishma from Chasing Faerytales (aka one of the coolest/greatest/loveliest blogs ever) has been kind enough to nominate me for the Infinity Dreams Award in this post of hers. Normally I forget to do these kinds of stuff, but NOT TODAY. I hate typing the actual number unless it’s math or a really big number. I prefer doing them word-style. Small talk is my greatest enemy. I play the bass, guitar, some piano, clarinet and am attempting to learn the drums. I consider these facts about me terribly boring I am so sorry. I’m fluent in three languages: english, fandom, and sarcasm. Percabeth is my OTP anyone who wants to disrupt my ship fIGHT ME. Don’t actually fight me I’m like 4’11” and a potato I wouldn’t survive. Is there a book which you would recommend to any one? Harry Potter and Percy Jackson, basically. I cheated and named two series teehee. What movie do you wish was a book? I actually will never be able to answer the question because I am utterly terrified of seeing my beloved stories getting butchered by ill-directed movies so I think I’ll skip. Is there any fictional character you would swap lives with? To be honest not really because all the fictional characters I’d consider switching lives with have incredibly active and dangerous experiences and I’m pretty sure if I was faced with anything bigger than a spider I’d pass out. Even spiders make me cringe. Who was your first ever fictional crush? Which book do you never get tired of rereading? This post is already 80% Percy Jackson. I will say it again and again. On a scale of 1 to 10, how artistic are you? Uhm… maybe a seven? Eight? Not too too artistic mind you. Which genre do you never touch? Honestly I’m trying to stay away from the paranormal scene because I feel like so many of them are cookie-cutters of each other. Let’s spread some blog love! Name your top 5 favourite bloggers and tell why! Mishma – Why else? She’s an amazing potato and she’s got great posts that really gets you thinking and questioning. Gabi – This girl’s an A-grade fangirl and an A-grade friend. I honestly can’t believe we’re friends when there are so many greater people than me. Deanna – This lady’s something fantastic. Is amazing at defending her beliefs and doesn’t back down PROPS TO YOU. Maha – One, she’s a UNICORN. Two, she’s incredibly sweet and incredibly kind. I just I just HOW ARE YOU SO AMAZING? Sophie – Weelll can I say that it’s amazing because we’re CANADIAN BUDDIES? Not to mention that she’s a fantastic NaNo cheerleader! Xan – I don’t talk to her a lot but her bookish photos are literally GOALS. GOALS, PEOPLE. Greatest moment of 2015? Be it blog-wise or life-wise. Make your ultimate book squad! Which fictional characters do you pick and why? If you had to go to any fictional place for vacation, where would you go? Name a strange habit you have you didn’t know you did until someone pointed it out to you. What would you have named your blog besides the name you already have? Name your biggest blogging fear! How did you find your blogging voice? FREEBIE (aka I ran out of questions). Thanks for the tag lovey! <3 I can't wait to jump into it and write it up! Your facts aren't boring! Stop putting yourself down and give yourself some credit, you are actually a very interesting and amazing person…I mean just look at your BEAUTIFUL blog!! Ugh, I wish I could ship Percabeth as hard as you can! I've only read book one so far and I'M BASICALLY HYPERVENTILATING WAITING TO GET MY GRABBY HANDS ON THE NEXT ONE. But for now, I only mildly ship Percabeth since I've only read one books of them so far. I am prepared to go down with the ship and ship till I can't anymore! OH OH ALSO; how do you do that cool thing where you hover over the list and it moves?? FOR SOME ODD REASON I LOVE THIS. I was running my cursor over the list for a solid three minutes…no lie. HOW did you do this? I find some Percabeth shippers so cute! 😀 I haven't read the series – hides – but I find the fandom adorable!